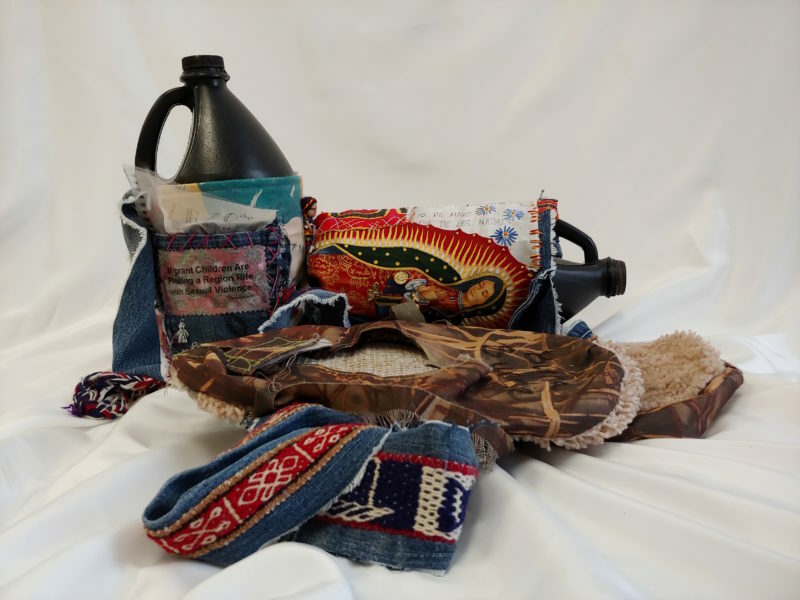 When I attended a photo shoot for The Migrant Quilt Project I was struck by the fabric slings for water bottles that Jody Ipsen brought from campsites along the border. Jody is the founder of the MQP. Crossers or their loved ones or immigrants rights groups make these slings hastily. They sometimes include encouraging messages like bueno suerte (good luck) or contigo en la distancia (with you on your journey). It hit me how these migrants had to carry enough water with them to survive their journey. They had to decide what to carry with them across the border, and what to leave behind on their way to a new life. The items left at campsites or layups tell of a journey fraught with peril and loss. Jody allowed me to photocopy pages from a book for prayers to Santa Muerte, or Saint Death. Santa Muerte is important because she can protect crossers from violent death. Jody also shared copies from a small notebook filled with handwritten poetry or Verzos. (One of those poems is for Mother on Mother’s Day.) Ten dollars worth of pesos secreted into hand-stitched hems is another frequent find. Migrants often carry milagros or votives with them. Empty gallon jugs and carpet shoes, which mask footprints when worn over street shoes, are common in layup sites along the border. My version of these slings include headlines from American newspapers about the official policies dealing with migrants, as well as reproductions from prayer and poetry books found on the border. Found objects (water bottles and carpet shoes), deconstructed American flag and denim jeans, vintage mola (maker unknown), milagros, woven textiles from South and Central America (makers unknown), silk organza, cotton, vintage Mexican flag collectible, Virgin de Guadelupe fabric, facsimiles of found objects, fusible web. Machine and hand stitch, image transfer, fusing, applique.